The first one is dressed with a salsa tomatich (tomato salsa). The word salsa is actually Arabic in origin. The second one is dressed with a spicy chermoula. Both take about 10-15 minutes to prepare and at least 8 hours to marinade. Serve with a salad and kesra or khobz for a delicious and light summer meal. This spicy soup can also be made like a stew with less water with fennel, pumpkin or chick peas added. With even less water it becomes a shatitha. Shatitha means "sauce that dances". Shatta is a type of chili. If you make it like a soup you can add bulghur wheat or vermicelli noodles to the broth. If you make it like a stew serve it with flat or leavened bread, some people would eat it with bulghur or semolina couscous. If you make it like a shatitha you can serve it over pasta. Octopus cooked like this is very tender and not at all rubbery, It's hearty and satisfying. In Los Angeles whole shrimp with roe are easiest to find at East Asian markets. If you are accustomed to eating shelled shrimp you are missing lots of flavor. Algerian cooking is always about flavor, even the simple dishes will have depth of flavor. The Algerian way of eating is always about enjoying the food. There is none of the French politesse or puritanical parsimony. An Algerian feast possibly looks shockingly excessive to others. I do not know, because I am a native. Okay, born in France, but I am still ALGERIAN. 2) Saute the chilis and shallots in olive and butter over medium heat until they start to soften, be generous with the olive oil and butter. You'll have more sauce! 3) Add the garlic, cook for a few minutes. Turn up the heat to high, add the shrimp, season with salt and cook until they just curl up. Do not over cook. A variation of this is add some fresh chopped tomatoes to serve over pasta or with rice. As usual you can add spices or not to this dish. Squeeze on the lemon juice before eating. I'm getting a little tired of eating chicken. I'm really a lamb and beef eater. That's how my family eats in Algeria and in France. In Los Angeles I find myself eating more beef, Korean bbq to be specific. We'll leave the farm in Setif for this preparation. Actually there is a lake in Setif where people fish, for what I do not know since I have never been there. I can ask though. 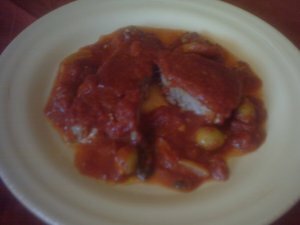 This is a tuna dish made with slow cooked tomato sauce, homemade tomato jam and almond stuffed olives. Some of you may be wondering about the lack of spices in the dishes that I've presented so far. The Algerian cooking I grew up with used spices with a gentle hand or none at all. It has nothing to do with growing up in France either. Many Algerians in Algeria will say the same thing, others will argue that cooking without spices is ridiculous. My family cooking did not use a lot of garlic, onions and peppers either. Again, other Algerians will agree and others will disagree. Algerians for the most part won't argue about authenticity but we do argue about spicing and seasonings. The tuna in this dish is cooked through in the typical Mediterranean manner. But it is still moist because of the cooking method.